Watching between round is one of my favorite thing to do when it comes to racing. 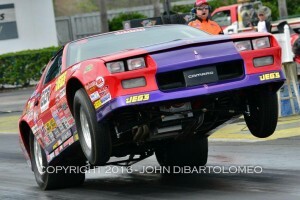 Up on the top end, hearing drivers start to kick it and rip it at the 1/8th mile there is nothing better. 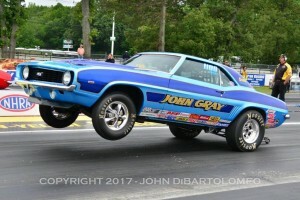 During the Maple Grove Divisional I found myself on the starting line, ear plugs in, cars doing burnouts and I hear music. And see a driver in his car, getting pumped up blasting his radio in his racecar. And it’s a Porsche. Not something you see every day. 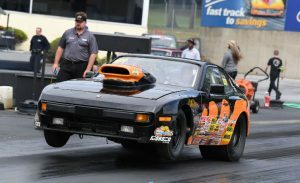 Keith Mayers and his Porsche and set on kill at the moment. 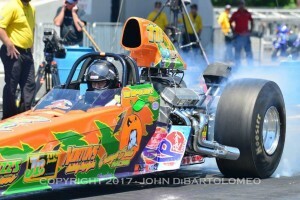 During the start of the season which, I believe would be his second race of the year, he took the tow down to “Hot-Lanta” to try his luck at a big wally. Having to pick and choose where to go because Super Street is not offered much. He previously has won one other national event title in Super Street. During the race, the first few rounds his reaction times were within a few thousandths of each other, making him feeling very comfortable going deep in the rounds. During the fifth round his light was a little greener then I know he hoped, but it didn’t matter. Because his opponent, Douglas Wood lit the bulb up a little too soon, going -.002 red. Giving him the free run, and data for the final round. Set in the final he faced Jesse McKnight and the 133 degree track temperature. After the tree dropped, Mayers had all the room he needed to seal up the victory, his .017 light to McKnight’s .060 bulb. 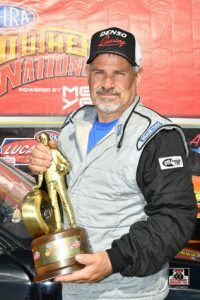 He scored his second National Event Victory, the highest high you could have being a loyal NHRA Division One racer turned sour way to quickly. Unfortunately Atlanta has been know to be a place where you have to keep an eye on your equipment. During photos, someone stole their scooter from right underneath them, I am not 100% sure if it was returned yet or still missing. All of that being written before last weekend where Keith and his Porsche were unstoppable once again. 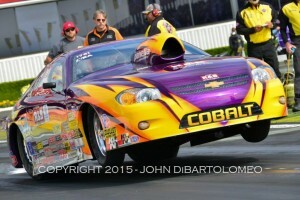 Radio bumping, turning win lights on starting on Saturday, where he was able to sneak his way into the Top 8 Shootout. Winning all three rounds, not skipping a beat, rolling around to first round on Sunday, you see the Porsche first in line. Racers quickly jumping lanes to avoid him, and once someone rolled down the lanes to face him fellow racers started to clap, yes this really happened. His lights were pretty good all weekend, most of the time leaving first, and wheeling and dealing win lights to his lane. In the final, he faced Don Garbinski, the number three finisher in the division last year. The lights drop and Mayers was out first, but only by .002, Garbinski got ahead but broke out by -.004, Mayers was dead one on the 10.90 for the win. I was also notified this was his 30th straight round win, starting before Atlanta with the .90 Series Race #2. The Mid-Atlantic .90 Association is perfect place to get seat time and race with some of the best .90 racers in the tri-state area. The purse is very good also, a nice $1000 to win each day. He’s riding off confidence, be sure to keep an eye on Keith and to see if he can continue the streak? Who will be the one to take him down? Remember you have to beat the best to be the best. And thank you Keith for being a very active member of the forum. The streak ended at the mid Atlantic .90 association race at Atco in the finals no less. Dom Burgess stopped the count at 33 consecutive round wins. Congrats Dom, What a ride!